Diarrhea among elderly can lead to serious complications. It can be managed through hydration, probiotics, BRAT diet, OTC medications or medical treatment. Diarrhea is a common condition that affects many people including children and the elderly. If not well managed, diarrhea can lead to serious health issues. The National Digestive Diseases Information Clearing House reports that an American adult can experience an average of one acute diarrhea episode every year. The organization has described diarrhea as a loose watery stool. Diarrhea affects seniors due to various reasons. Acute diarrhea in the elderly can be indicative of a serious underlying condition or chronic illness. What Causes Diarrhea in Elderly? To understand the cause of diarrhea, first, it is imperative to understand what it is and how it happens. Having more than three watery bowel movements in a day is often a sign. This faster than normal bowel movements can happen due to various reasons including being a symptom of certain diseases and conditions. More so, there may be poor re-absorption of fluids in the body, leading to excess fluid in the bowel, thus causing loose stool. Use of antibiotics may also increase certain microorganisms in the gut exponentially; for instance some bacteria called clostridium difficile. This disturbance of the natural balance of bacteria in the bowels may lead to diarrhea. Most cases of diarrhea in elderly are due to weak immune systems which are prone to attacks. Eating contaminated food can cause diarrhea but that is not the only cause, a change in diet can cause a disturbance in the normal function of the digestive system (gastrointestinal disturbance) and thus lead to diarrhea. However, this situation does not last long. Diarrhea in seniors has a double threat of maldigestion (poor digestion) and malabsorption (poor absorption of nutrients). This imbalance often leads to diarrhea. Examples of the above include lactose intolerance (poor digestion of milk) and problems with the gallbladder may lead to a loose stool as well. Use of certain medications may lead to diarrhea as a side-effect. As discussed above, antibiotics may cause an imbalance in the bowel bacteria and lead to destruction of friendly bacteria which can cause diarrhea. But it is not antibiotics only; other drugs such as anti-depressants, cancer medicines and antacids may cause an irritation in the bowel and cause poor absorption of water in the colon leading to loose stool. These drugs can sometimes increase bowel motility as well. Diseases that affect the bowels such as IBS (irritable bowel syndrome) and IBD (inflammatory bowel disease), diverticulitis (inflammation of the pouches found along the digestive tract) have diarrhea as a common symptom. Diverticulitis is more likely to present with diarrhea in elderly people. Recent surgeries in the digestive region can also lead to diarrhea especially if digestion and absorption of nutrients are affected. Additionally, colorectal cancer is also a common cause of diarrhea in older people. There are other factors that can contribute to diarrhea in the seniors which are not directly related to the bowels. Stress can cause diarrhea which may be acute during the first 24 hours of the stressful period. For the elderly, factors such as change of routine, environment or traveling may also cause tension and thus lead to diarrhea. In such cases, no medication is required because the bouts of diarrhea usually stop on their own. Conditions such as diabetes can contribute to diarrhea indirectly through damage to the nerves which control bowel movement. Diseases of the pancreas may also lead to diarrhea if the pancreatic juices that aid in digestion are affected. The major health risk presented by diarrhea is dehydration which can lead to serious health complications. 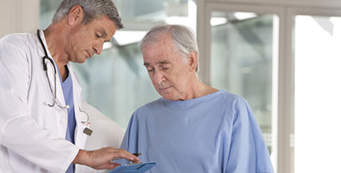 In elderly people, diarrhea can be more severe if the patient is not properly taken care of. A person having bouts of diarrhea needs to rehydrate as often as possible. Another health risk posed by diarrhea is malnutrition. Most senior people rarely eat healthy meals to provide them with the nutrition they need. A bloody stool may be an indication of bacteria such as salmonella. Severe diarrhea that involves more than three loose bowel movements within 24 hours, needs a doctor’s attention. This is more important if the patient is elderly or has another health condition. How Should Diarrhea in Elderly Be Treated? When dealing with diarrhea in the elderly, it is imperative to address it immediately to avoid severe dehydration and malnutrition. Usually, diarrhea is a symptom of an underlying disease which should be treated first. If the elderly person is unable to take oral rehydration, then a visit to the doctor is needed. For management at home, plenty of fluids and bed rest are required. Small frequent meals that provide nutrition should be given frequently. The food should be bland to prevent irritation of the bowels. Certain foods are good for managing and treating diarrhea at home. Bland foods such as boiled potatoes and baked chicken (without skin and fat) are usually tolerated. Avoid giving fatty foods, dairy products, spicy foods, and caffeine. This mixture is helpful in managing diarrhea in the elderly as the salt helps to reduce loss of water while the sugar helps to increase absorption of water in the colon. The BRAT diet is a popular diet recommended for diarrhea. It can help treat diarrhea in the elderly. The name stands for bananas, rice, applesauce, and toast. These are foods that are low in fiber and help to make the stool firm. Bananas are high in potassium and will help restore lost nutrients. Zinc supplement can be effective in reducing diarrhea; also soy, German chamomile, and Blond psyllium can help. There are some over-the-counter medications that can be used to treat diarrhea. Probiotics help to replenish the good bacteria in the bowel thereby restoring balance and promoting a healthy gut environment. When the symptoms of diarrhea in elderly persist, it is advisable to seek medical care or buy diarrhea treatment to treat it and prevent dehydration. Be sure to consult your doctor before buying any medication. Because the effects of diarrhea in the elderly can escalate rapidly, it is best to seek medical attention immediately. Call your doctor if you notice signs of fatigue, loss of appetite and fever.